Heat oil in a frying pan and add mustard seeds. When it starts to splutter add curry leaves, dried red chillies, ginger, green chillies and saute for a minute. Add the chopped cabbage and slowly stir for a minute. Add salt to taste and cover the pan with a open lid. Do not add water into the cabbage thoran instead of that pour 1 glass of water in the open lid and cook in low heat. When the water getting warm remove it and pour another glass of water. (Most of these recipes if you add water it will turn soggy to avoid this you can use this method.) Stir occasionally. After 5 min add the grated coconut and stir well. Leave it for 1 min and it is ready to serve. 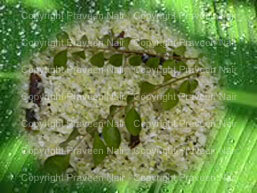 Transfer the contents into a serving plate and decorate it with curry leaves.